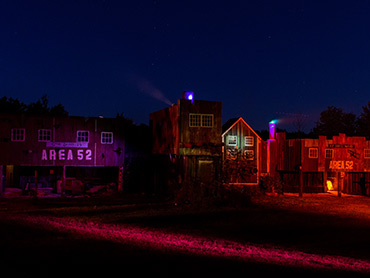 Haunted Acres is a gem, one of my favorite Halloween destinations, which in a previous year I called the best Halloween attraction in New England! It’s near Manchester, New Hampshire and just an hour’s drive from Boston. Every aspect of the place has attention to detail with unique, theatrical set design, actor training, and storytelling. 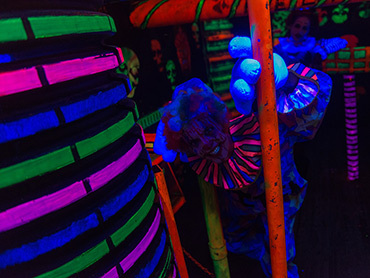 Haunted Acres takes place on the grounds of Candia Springs, which is managed separately and is a water park in the summer and in October they still run a daytime ropes course through the trees and a zipline. At night, that becomes the haunted zipline! The harness is exceptionally comfortable and you zip down 1,000 feet with a friend on two separate lines that take you over a pond, for just $10. Then you can get a photo taken, eat dinner — this year the selection of foods was too small — or sit by one of two campfires, enjoying the night air, warming yourself, and encountering characters such as Jack from Nightmare Before Christmas, who comes by on stilts. So you’re already having a great time and you haven’t even been to any of the attractions. We were delighted to see again the 3D Nuclear Accident House. You put on special glasses that make the paint pop out at you, and the building that you walk through has not just randomly painted walls — such as the mediocre 3D attraction at Witch’s Woods — but a real theme of a nuclear accident site with props and decorations all painted to fake you out and misdirect you so that actors can scare you. The Maze from Hell was understaffed this early in the season, but still fun to talk through a black-painted maze of plywood walls. And Area 52 is a secret government facility where you’ll get sent down dead-end corridors. The biggest attractions, though are the two woods walks, the Nightmare Walk and the Graveyard of the Damned. Walking through any woods at night in New England is scary, but you’ll find animatronics like a 15-foot demon that screams at you and waves its wings. And lasers and fog that make the forest seem like it’s spinning. What truly remarkable about Haunted Acres is how theatrical it is. The actors have a storyline that they follow and something to say, instead of just roaring at you. The makeup is unique and inventive, following the theme of the attraction itself. Because of dinner shack and bonfires, you can hang out, warm up, and just enjoy watching other visitors shrieking and meeting monsters. It is delightful. Although I love many other Halloween attractions in New Hampshire, such as Haunted Overload, Canobie Lake Park Screeemfest, and Fright Kingdom, Haunted Acres is again my 5-star top pick in New Hampshire and a contender for best Halloween attraction in New England! 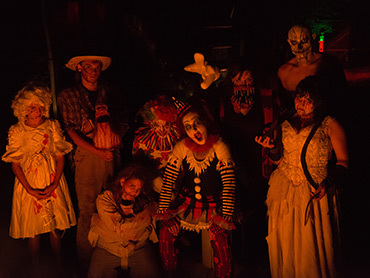 This year on Sunday October 29 they’ll have a “lights out” special where Haunted Acres will be especially dark.